Once again I feel compelled to begin my post with an apology. Too much time has elapsed since I last wrote—I’m sorry! Maybe I just need to drop the apologizing altogether. I assume (and hope) my readers are blissfully unaware of the large gaps of time that have elapsed between my posts as of late. It is summer, after all. If this post seems a bit eclectic, it is because I am feeling a bit eclectic these days—a little serious, a little lighthearted. I trust you will find my musings enjoyable and thoughtful, nonetheless. My prayer life seems to be in a rut lately. Okay, maybe more like for awhile. I hoped that once school ended and I was less busy I would notice a difference. Not so. I am beginning to wonder if I have lost my ability to stay focused. My mind seems intent on wandering as soon as I start “to pray.” I have read enough on prayer to know that instead of despairing and giving up, I should take whatever it is that wanders into my thoughts and pray about those things. Now, if I can only remember to try this great suggestion when it is actually happening! A couple of Sundays ago when it was blazing hot and the only thing to do was to curl up and read a book in the air conditioning, I stumbled across a helpful way to think about prayer. Jan Karon wrote a series of books called The Mitford Books about a priest named Father Tim and his delightful, yet quirky, parish in North Carolina. The series introduce some loveable characters along with some surprises for Father Tim. I recommend the series. They are a perfect summertime read. In 2007, Karon wrote Home to Holly Springs, which is the story of Father Tim returning to his boyhood home and town to take care of some unfinished “business.” In this scene, Father Tim is a teenager and the rector of his church is talking to Timothy’s (as he was known then) father. Father Polk sees something in Timothy that impresses him and causes him to think Timothy may be cut out for church work and he wants Timothy’s father to see this. Perhaps you already have this notion of prayer figured out. But I was struck by the line, “Prayer is getting into relationship with God.” Too often I become preoccupied with what I think are the mechanics of prayer. Did I express enough adoration? Did I confess my sins? Did I have an appropriate balance of asking for help, things, etc. versus thanking God for the many blessing in my life? Thinking about prayer as an extension of my relationship with God is helpful. The emphasis shifts from prayer being about me and whether or not I feel like I am praying well enough to being in a relationship with the God of the universe—pretty amazing when you think of it like that. Finally, nobody says it better than Eugene Peterson. I am working my way through Practice Resurrection—a conversation on growing up in Christ, which is an in-depth look at Paul’s letter to the Ephesians and how the church (particularly the American church) should think about growth in Christ. With great relief I read the following: “We pray when we are meditatively quiet before God with Psalm 118 open before us; we pray while taking out the garbage; we pray when we are weeding the garden; we pray when we are asking God to help a friend who is at the end of her rope; we pray when we are writing a letter; we pray when we are in conversation with our cynical and bullying boss; we pray with our friends in church; we pray walking down Main Street in the company of strangers.” Amen. Back in June when I visited Waco, I went to the “new and expanded” Farmer’s Market. This delightful venue opened after we moved, but it is the place to be on a Saturday morning in Waco. One of the stands made and sold crepes. When Anna visited Waco, she also enjoyed the crepe booth, and has been asking to make crepes ever since. So this past Saturday we made crepes. Fortunately, I saved a recipe for crepes from the Chicago Tribune way back when we used to live in that neck of the woods. You know a recipe is good when it turns out just like the author says. As much as I think the wooden paddle (it looks like a “T” except with a longer top line) that the ladies in the crepe booth used to smooth out the batter looked cool and necessary, you really don’t need it or a special crepe pan. I used my 9 inch non-stick sauté pan and the results were fine. We ate our crepes for breakfast with jam, whipping cream, fresh fruit, granola, and Nutella as fillings. 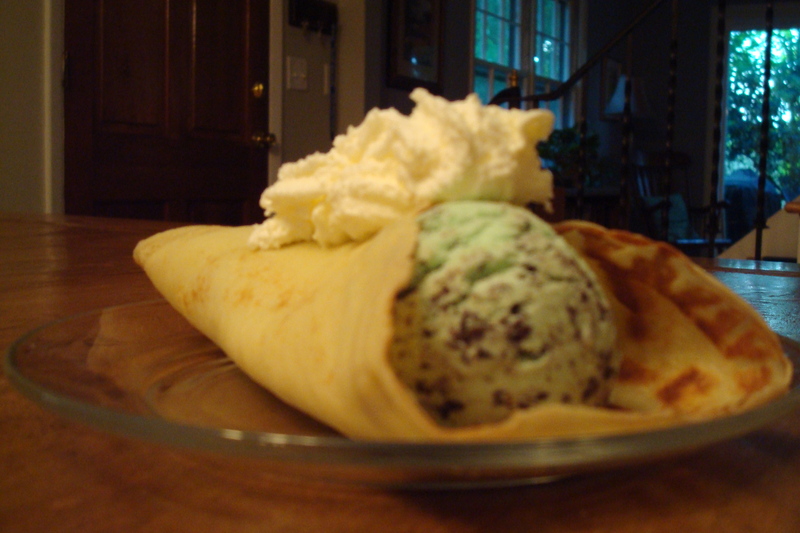 But crepes also make yummy desserts as my photo suggests. For those of you who are purists, I know that I didn’t fold my crepe correctly (it is supposed to be folded into a triangle), but for ice cream as a filling, folding it like an omelet worked just fine. Alicia, Thank you! I contribute my “fuzzy” days to being older, as why I often fail to focus on the steps of a prayer, instead of taking the time to have a relationship with God.